You no longer have to go to third parties for add ons as most cabinetry companies integrate these accessories right into their manufacturing process as shown below. For really unique and specific needs we are proud to offer Rev-A-Shelf, Richelieu, and Hafele top of the line kitchen organizational products. This is the most popular accessory in a 21st century kitchen. With multiple combinations, cabinets that house the garbage save floor space in the kitchen as well as keeps the focus on your beautiful finishes and not an overflowing trash bag. The most common format is double 43 quart bins hanging lengthwise inside an 18” base cabinet. You can choose from a full size height door where the bins sit on the wire track or two hanging bins with a drawer on the top. Formats for 15”, 18”, 21”, and 24” width cabinets are available. Base cabinets with roll outs save you time and energy. Say goodbye to vast cavernous cabinets with low light and hard to reach shelves! Roll outs bring your items forward for easy access and save your back from endless contortions. Heights and quantity of roll outs are flexible. We also provide base cabinets that are only 6” wide that we often install to the left and right of a range. These one door cabinets have two shelves built in that slide out on tracks when opened and are great for holding oils, spices, and your favorite flavors. Two open sides allow for easy viewing and reaching capabilities. Locating these pull outs near the cooking workstation allows for less digging through the cupboards and more time with your guests. Our pull outs can be made with or without a decorative fluting; your choice! Specialty glass and mullions are available to create a unique and decorative aspect to your cabinetry. Glass doors on cabinets create a lighter feel. Glass is a great way to distinguish certain areas of a kitchen from another. We like using glass fronts on a wet bar area to show off our clients pretty collections. Often lighting is added to glass cabinets to really brighten up and showcase household items. Check out our Home Bar section for some great examples of glass installations. 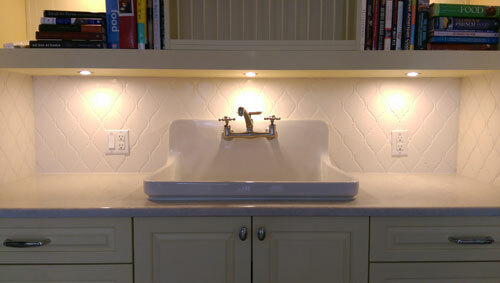 Whether you’re renovating an entire kitchen or you find that your kitchen space is very poorly lit, the need for under cabinet lighting is essential to a design. From having guests over for cocktail hour, prepping for the bake sale, to your regular nightly routine, appropriate lighting needs to available at all times. For a modern space, we have installed colored LED lighting above cabinets at the ceiling which adds a special urban flare. Finding the best solution for a corner cabinets can seem daunting at first but these days there are so many options that make the space inside the corner of a kitchen really functional. From chrome pull out systems, to wooden Lazy Susan shelves, and spinning recycle bins, there is most likely an option for you! There are a number of systems of pull outs in chrome, lined wire, and wood in a few different shapes that come all the way out from the corner of your cabinet and you no longer have to go digging! Check out our Houzz ideabook for a number of corner remedies.